From Rickety Kate, to baccarat to solitaire, AustralianCardGames.com.au has got you covered. This website is a comprehensive portal for card game rules, strategy and where to play titles online for real money. Our team is built from people who are passionate about the somewhat lost social hobby of playing card games and we will strive to deliver you accurate and comprehensive information on hundreds of games. Sitting on the back porch or at the kitchen table and playing card games has long been a staple of the Australian household. The social aspect is the drawcard for most, while other people wager cash to spice things up. As the online gambling industry grows to unprecedented levels so have the array of card games available to play for real money. AustralianCardGames strives to stay on the cutting edge and present the best and latest safe websites to our readers. The leading online casinos offering card games to play for free in practice mode or for real money bets are all listed in our table of recommended casino sites above. These casinos all offer card games from the world leaders in online gaming software, along with rare and unique game rule variants. No downloads are needed, just load and play games directly over your Web browser. Playing card games on your mobile phone for real money is very possible. Many online casinos and poker sites report a 50/50 split between mobile (tablet and smartphone play) and users on desktop computers. This means more and more money is being poured into the development of games for devices like iPhones, iPods and Android-powered phones like Samsungs. While the game selection won’t be as large on a mobile device, there will usually be versions of blackjack, baccarat, three card poker, Casino Hold’em and many more. Recently live dealer software providers like Evolution Gaming has evolved their live dealer software to work on smartphone and tablets – which is definitely worth a look. You can check it out at G’day Casino. Each of the casino websites recommended in the table above is licensed in a respected jurisdiction and is cross-checked for fairness by organisations like eCOGRA. Each website we promote has different card games available. You can read individual reviews of each site and the card games that they offer using our links in the table. The first known record of the existence of playing cards came from China in the 9th Century during the Tang Dynasty. 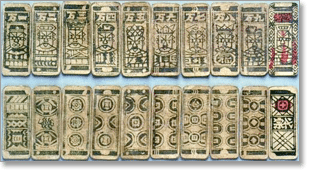 These initial playing “cards” appear to actually be leaves, but they soon evolved into smaller pieces of paper when books replaced scrolls as the preferred format in China. Playing cards came to Europe in the late 14th Century by way of the Moors, Saracens, and Mamluks of the Arabian Peninsula and North Africa. Initially these cards were used for divination and fortune telling and formed a mystical tradition known as the Tarot. The initial Tarot decks included four suits numbered one (Ace) to ten, along with four court cards that were variously named King, Queen, Knave, and Princess or Roi (King), Dame (Queen), Chevalier (Knight), and Valet (Jack or Knave). In addition to these suited cards, the Tarot also included twenty-one suitless “Trump” cards that featured various mystical symbols, and an extra card with the rank of zero, known as the Fool. While these cards eventually dropped away from decks as they became standardized to play games, the Fool resurfaced as the Joker as an addition to decks made for the card game Euchre. Perhaps it is the mystical origins that accounts for clockwise being the standard order of play in many Western European countries because turning counter clockwise (widdershins) was considered a form of black magic. However the practice derived, decks metamorphosed in purpose from fortune telling to games. The four court cards were reduced to three (King, Queen, and Jack), and the standard 52 card deck came into popularity. In the 16th-18th Centuries as Europeans colonized other parts of the world, they took their playing cards with them and developed all sorts of new games, some that included the full 52 card standard deck and others that modified this standard deck. Listed here are some of the broad variations in card games that have developed over the years. Most card games will have developed from others that fit into these various “families” of game styles. Poker is the most popular card game on the planet with the ‘boom’ still well and truly in swing. Trick taking games involve each player turning a card face up and one player winning the collection of cards played (called a trick). Sometimes the object is to take the most tricks, but sometimes the object is to avoid taking tricks. These games often involve the use of a trump card or suit which beats other cards, and a round of bidding before play. Common examples: Five Hundred, Rickety Kate, Euchre, Solo Whist, Bridge, Oh Hell! These card games typically have as their object an attempt to discard all of one’s cards and be the first player without any cards. Comparing games involve trying to have the best hand compared to your opponent or opponents. The best hand can be based on certain requirements or by adding the numerical values of the cards together. Matching card games involve trying to collect all of ones cards into organized ranks, suits or sequences. Common Examples: Donkey, Fish, Jo, Rummy. While this website largely focusses on games that are played just for fun, for those games that are played for real money either at a home, a casino or online there are rules governing gambling on card games. Technically, Australians are not allowed to gamble on card games at home, but we all do, and we have never heard of an Aussie being in trouble for playing a friendly game of poker or other wagering title among friends. On a bigger scale, Australians can legally play at one of many land-based casinos around the country. The biggest and probably the best being Melbourne’s Crown Casino, which is part of Crown Resorts, the company controlled by mogul James Packer. Each of Australia’s capital cities boast a casino with some of the more common card games including blackjack, baccarat, Pai Gow and poker. The laws regarding online gambling aren’t so clear cut. Australia’s online gambling laws are covered by the legislation of the Interactive Gambling Act (2001), which until recently was full of all kinds of loop holes that allowed Australians to play real money card games at a large range of online casinos located overseas. Amendments passed on the IGA in early 2017 have closed those loopholes, clearly stating it now illegal for any online casino to offer services to Australians unless it has received official licensing from an Australian state or territory. The catch is that Australia does not issue online casino licenses, so legally, there are no online casinos that have official authority to service the Australian market. However, despite the IGA amendments, there remains nothing in the laws to punish players who continue to gamble online, with the focus being on the operator instead. This means many offshore casinos (those that are legally licensed by an overseas gambling jurisdiction, operating within its local laws) continue to accept Australian players, and online card games remain hugely popular with Aussie real-money gamblers. If you do decide to play for real money online, make sure you stick with a licensed, reputable offshore casino that puts player protection at the forefront, like any of those recommended on our site. AustralianCardGames.com.au is run by a team of Australian journalists and card sharks. While we publish a large amount of content across many websites, we always strive to have people working for us and writing articles they are passionate about. For instance if we are writing about blackjack the journalist or content writer will know the topic, if they are writing about Uno the writer will know the game back to front… and so on.